You may have heard in the news a few weeks ago that 2018 is shaping up to be a boffo year for Hollywood films. Even poorly rated films like VENOM have done exceedingly well at the box office. What does this mean? Are audiences starved for entertainment in the wake of the extended Game of Thrones hiatus or are they just ignoring what we critics are telling them? Gosh, I hope it’s not the latter! 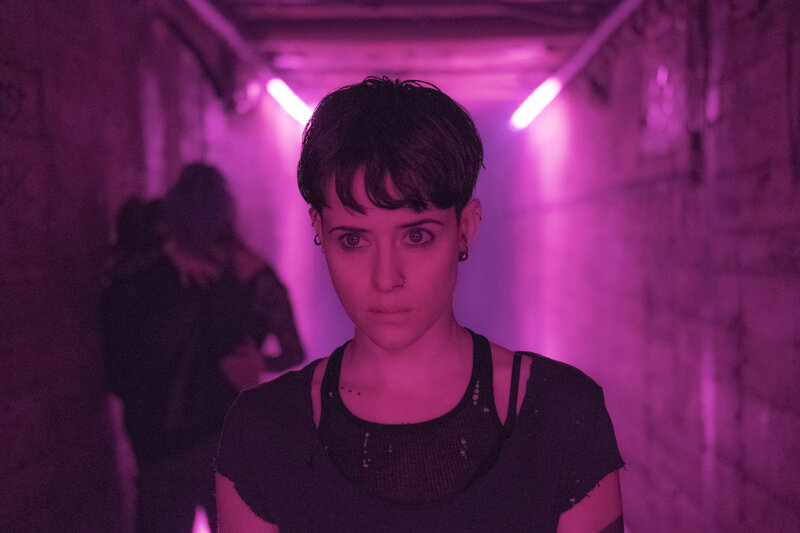 Included in the category of poorly rated films of 2018 is THE GIRL IN THE SPIDER’S WEB, though it’s still too early to know if it will be bulletproof, much like BOHEMIAN RHAPSODY is turning out to be. SPIDER’S WEB is the cinematic equivalent of a sprig of parsley that the restaurant serves with your order of grilled cheese. If you’re really hungry, you’ll eat it, and even if you do, it won’t be very satisfying and you’ll be left wondering why the restaurant even bothered. The film is a reboot of THE GIRL WITH THE DRAGON TATTOO franchise; however, this story wasn’t written by Stieg Larsson and it doesn’t star either Noomi Rapace (UNLOCKED), who starred in the Swedish original series of three films, or Rooney Mara, who featured in the 2011 American remake. This time we have Claire Foy (TV’s THE CROWN; FIRST MAN; UNSANE; BREATHE), who is making every effort not to be typecast. You go girl! Unfortunately, her turn as the Swedish-bisexual-Goth-computer hacker-abuse survivor-manhater-with the dragon tattoo in her back is not going to be remembered as one of her career highlights. It’s not her fault though. The film’s problems have more to do with the story and the direction than with her performance. In this outing, Lisbeth Salander is contacted by former NSA contractor Frans Balder (Stephen Merchant), who has written code that can access all the nuclear weapons systems around the world and consolidate them into one handy, little program called Firefall that fits on your bog standard laptop computer. That code is in the hands of the NSA but Balder still holds the password. Balder now has second thoughts about giving his country so much power so he asks Lisbeth to hack into the NSA’s highly secure servers, which she does quite easily, and steal the code. But others want Firefall too, including a major crime syndicate known as the Spiders, which is headed up by someone from Lisbeth’s past. Now Lisbeth has to deal with the Spiders; the NSA, represented by Agent Edwin Needham (Lakeith Stanfield, GET OUT; SELMA; SHORT TERM 12); and the Swedish Secret Service, represented by Deputy Director Gabriella Grane (Synnøve Macody Lund), who would like nothing more than to finally nab Lisbeth for being the capeless misandrist vigilante that she is. There is so much that’s lousy about this film that it’s hard to know where to begin. I’ll start with the script by Swedish author David Lagercrantz, who has taken over as the official author of the series following Larsson’s death in 2004. Action films always require some suspension of belief but SPIDER’S WEB takes it to new heights from Lisbeth’s ability to hack into anything from anywhere anytime in a matter of seconds, to her incredible driving skills that would put James Bond to shame, to her ability to quickly recover from being firebombed, shot, drugged, asphyxiated and having the crap being beaten out of her by a bunch of goons. And that’s just part of the problem. Lagercrantz’s Lisbeth is a cross between James Bond and Batman but she doesn’t hold a candle to either one of them. None of it is very convincing and it’s not even fun to watch. We know that Lisbeth will live on to hack another day but there’s little tension along the way where we may just think for even half a second that she won’t. And that problem lies with Uruguayan director Fede Alvarez (DON’T BREATHE), who is way out of his depth with this film. I’ll concede that he may have been hampered by having a low budget (US$40 million vs. the $90 million director David Fincher had for THE GIRL WITH THE DRAGON TATTOO) but he doesn’t seem to have spent his money wisely. The chase scenes, with one of them seemingly ripped from a James Bond script, lack excitement. Alvarez also should have hired a fight choreographer. As we saw very recently with the awful MILE 22, shaky camerawork is no substitute for a lack of choreography, and that’s what we have every time Lisbeth gets into a fight. We don’t need Foy to be a martial artist. We just need her to throw a convincing punch and execute a well-timed body flip on screen. There are plans to have SPIDER’S WEB be the start of a whole new series of Lisbeth’s adventures. So far, the box office isn’t offering encouraging signs that we’ll be seeing any more of these films anytime soon but you never know when it comes to Hollywood. Save yourself some time and money and just watch the trailer. You’ll figure out the whole story from that, including who the person from Lisbeth’s past is. You know you’re on shaky ground when the trailer gives away too much! Watch the review recorded on Facebook Live on Thursday, November 22nd at 8:30 am HK time!